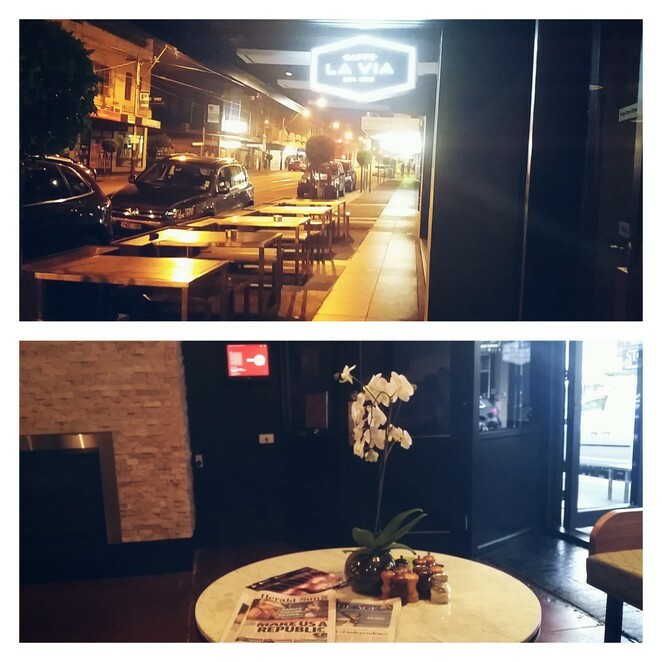 It was a nice summer evening when we ventured inside the warm, cosy Caffe La Via located at 252-254 Glenferrie Rd, Malvern. I was attending an invite to review this café. Glenferrie Road provides refuge to many good restaurants. I was about to find out whether Caffe La Via was one of the elite. After the initial introductions, Caffe La Via's manager Dhruv Chawla ushered us to a table next to the window. I found the seating arrangement modest yet comfortable. Soft, non-descript music played in the background. Animated conversation and happy laughter impregnated the air. Many patrons appeared to have come to grab a bite while some came for a cup of coffee. The establishment appeared child friendly and animal friendly. We noticed patrons with pets enjoying al fresco dinner. Dhruv handed us the menu. The expansive wine menu was in one word "impressive". The extensive food menu had something for every palate. My mouth salivated at the likes of Quail Egg Caesar, Soft Shell black crab burger, The Wolfer burger, Hand	Rolled gnocchi, Linguini with tiger prawns, Tasmanian	grassfed Eye fillet, Wild Atlantic Salmon and so forth. In the end, we just decided to go with the degustation menu Dhruv had planned for us. It soon became clear that Dhruv knows quite a bit about food and wines. Upon hearing our request for a good recommendation for a moscato, Dhruv invited us to sample La Spinetta Moscato Biancospino (bottle - $28), a moscato all the way from Tuscany, Italy. I am a big Brown Brothers moscato fan. But La Spinetta swept me off my feet and landed me in foodie heaven. It was light and tantalising but not overly sweet. Every sip of this exquisite moscato was a foodie delight. A good wine is always a good conversation starter. Imbued by the sumptuous wine we talked about the food menu which gets changed every 2 months making its contemporary and interesting. Most of the ingredients are sourced locally. The chef visits suppliers in Bacchus Marsh and picks fresh veggies for the café. Soon our first appetiser appeared. It was the croquette look-alike crispy mac (n' cheese) squares ($9). 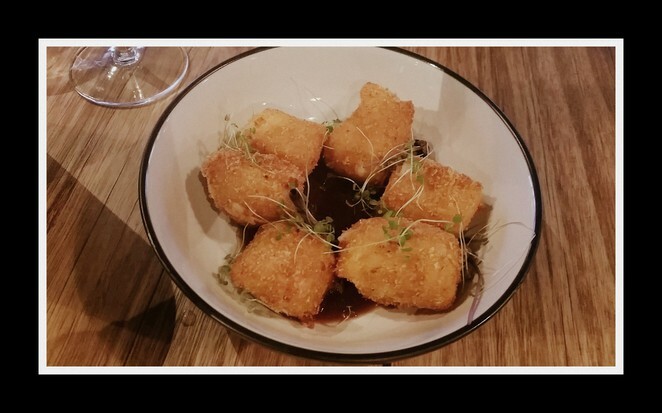 Mac and cheese cooked like croquettes and served with homemade BBQ sauce. The crunchy skin enveloped delicious melted cheese and mac. The gooey, melted cheesy goodness led us to polishing off every morsel of the squares. These squares upped our expectation and we eagerly waited for the next appetiser. 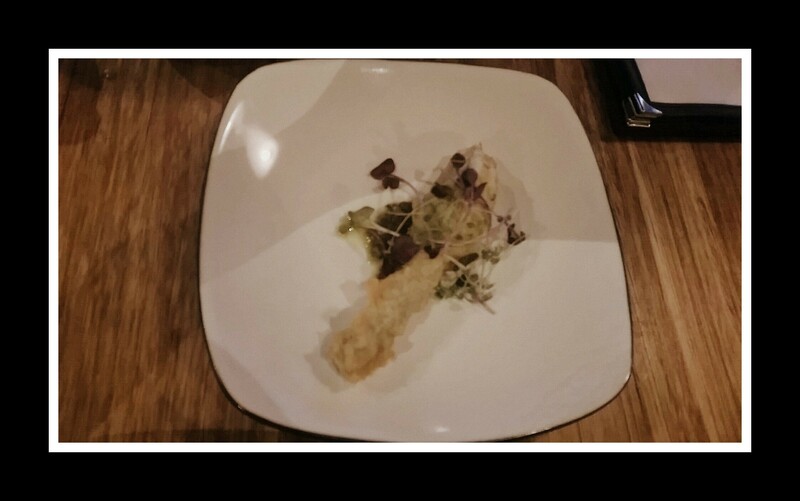 Battered Zucchini flower ($4.5 each) followed suit. Each flower was stuffed with ricotta, beer battered, lightly fried and finally served with an interesting mix of yoghurt and mint sauce which immensely appealed to my tastebuds. The beer batter was really light, non-greasy and made the flowers quite tasty. Next we were served the honey and rosemary lamb rack ($12) presented with mint sauce. The slow cooked lamb meat was tender and bright red inside. 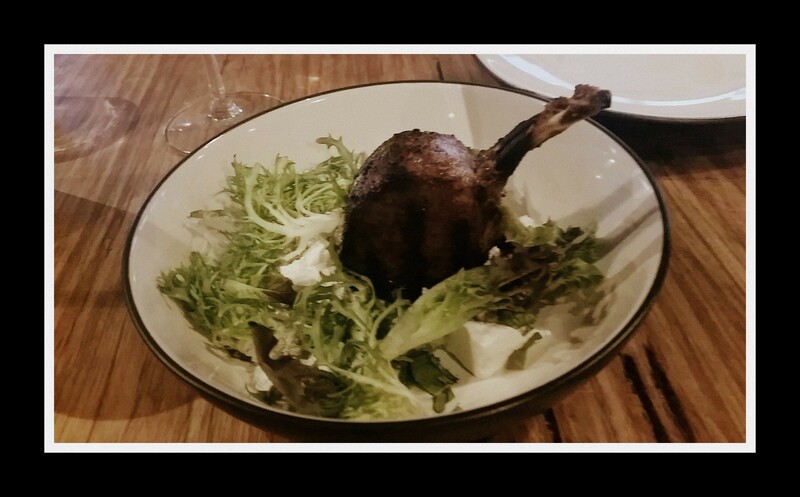 We found out that the lamb was procured from Peter Bouchier, one of the best butcher shops in Melbourne. The savoury lamb tasted good with the accompanying mix of yoghurt, mint and feta. Mint is inherently appetising. Yoghurt and mint works well together and this love affair was augmented by the mild saltiness of the feta making the mix enticing. By this time we had finished our lip-smacking moscato. 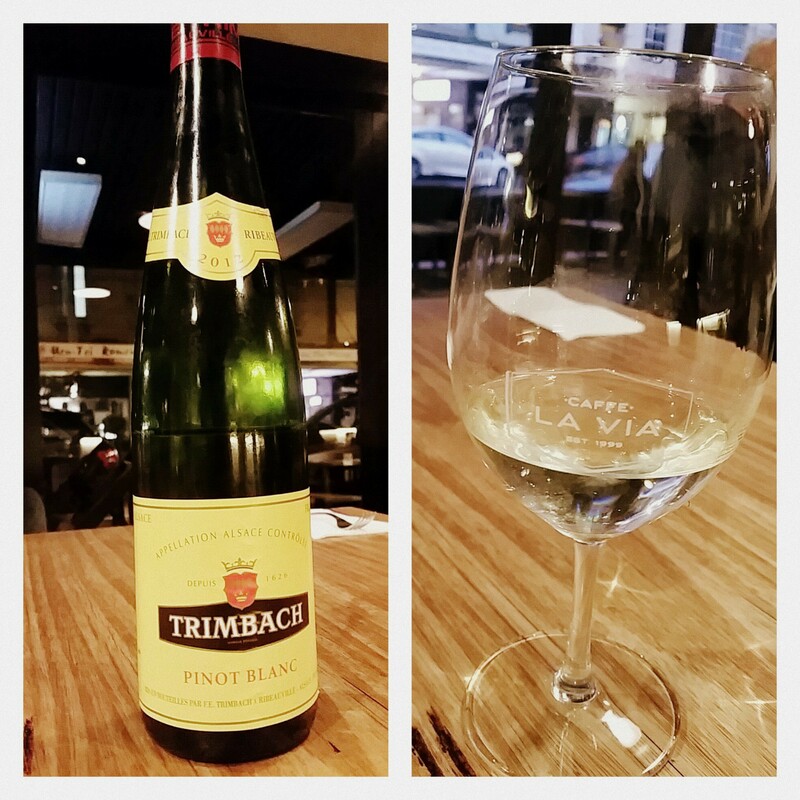 We were open to experimentation so Dhruv recommended a pinot blanc from France (Trimbach Pinot Blanc) to which we had no objection. Crisp and potent, this wine beautifully complemented our mains. Our first main was the marinara ($36) served with shaved parmesan. 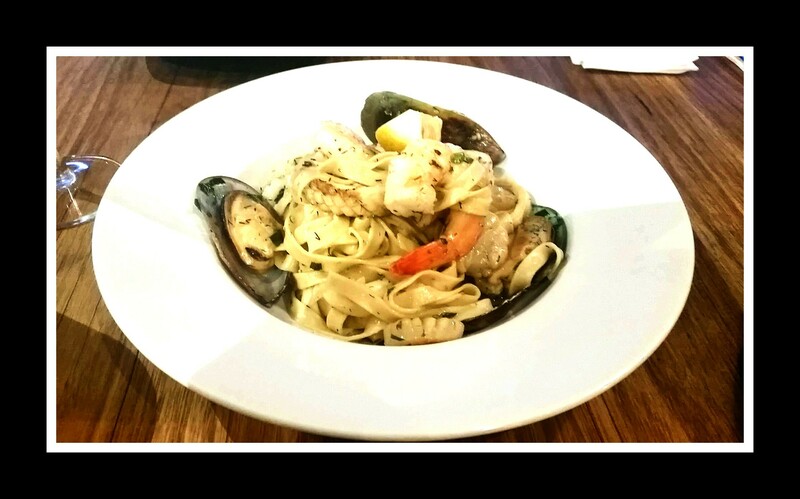 Fettuccine were cooked with tiger prawns, Canadian scallops , green mussels, squid, garlic confit and dill tossed in e.v.o. oil and herbs. The tiger prawns were plump and succulent and the scallops were juicy. Canadian green mussels were tasty. Dhruv explained that they used Canadian green mussels for their consistency. He stated that Canadian mussels are consistently big while local Australian mussels can come in all sizes. The fettuccine ("little ribbons" in Italian) was house-made and was nice. Overall, it was quite flavoursome. The next item we turned our mind to was the spiced prawns, chickpea and baby fennel salad with tahini yoghurt and freshly ground dukkah ($22). 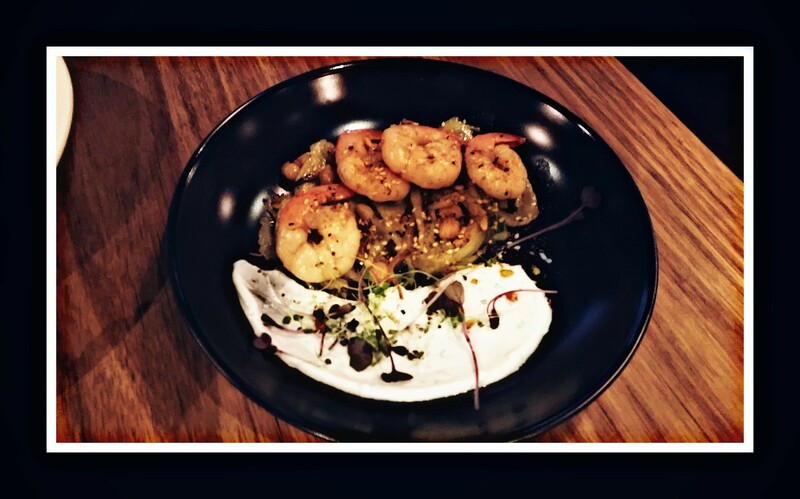 The tahini yoghurt in combination with the baby fennel enhanced the flavour of the juicy prawns. The house-made dukkah lent a unique flavour to the dish. It was a summery dish which enticed and pleased my senses. By now, we were pretty full but still had some room left for desserts. 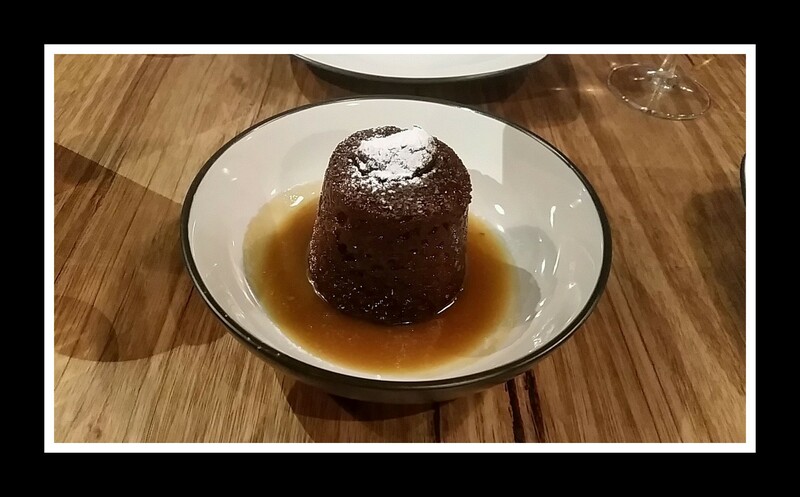 The highlight of the evening was the sticky date pudding ($11). It was house-made and served with butterscotch sauce and vanilla ice cream. The pudding was rich, moist and delicious. The sweetness had been done to the level of perfection. The indulgent butterscotch sauce elevated the experience. The result was an excellent, decadent delicacy that will leave you wanting more. 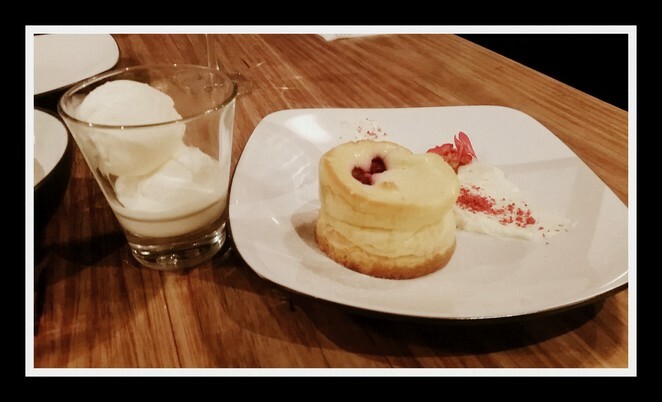 For our last dessert, we had the baked Cheesecake ($9) with white chocolate, vanilla bean and raspberry. This dessert paled into insignificance when compared with the yummy sticky date pudding. Knowledgeable service is definitely one of Caffe la Via's strengths. Dhruv and his crew know their stuff and are friendly and helpful. Dhruv is also good with pairing wines with food and is always prepared to make good recommendations. 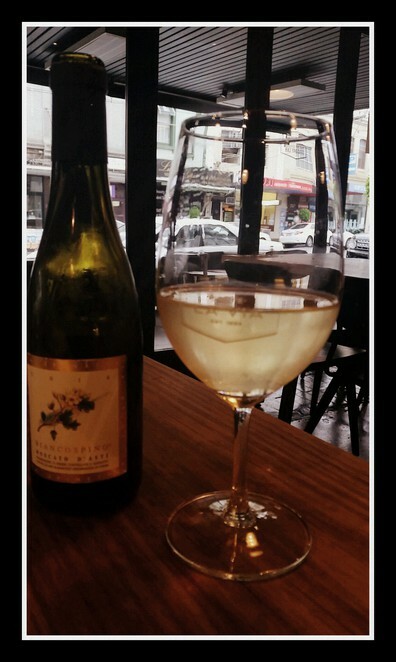 Food is lovely and the exceptional wine list stands out. 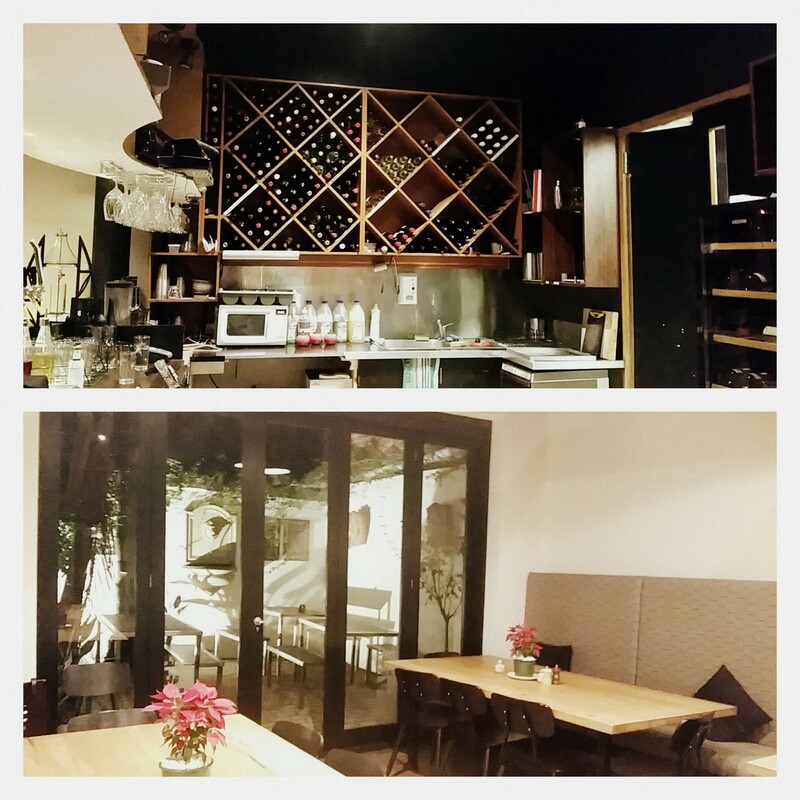 Comfy seating, casual and relaxed vibe and reasonable prices make Caffe La Via a hang-out for all age groups. And when you visit Caffe La Via, do not forget to try their coffee. 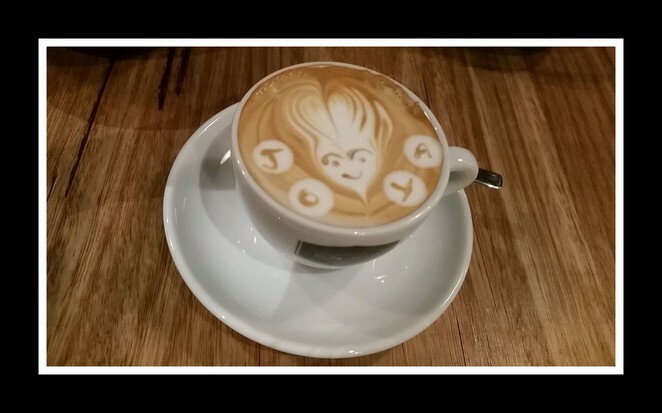 The barista is pretty talented!